The Garmin Personal Handheld GPS is a great tool for outdoor adventures who loves back to nature. Most of the Garmin Handheld GPS has rugged tough designed plus IPX7 water resistant rating. They are made to last in extreme Australian outdoor condition. Whether you are heading into outdoors camping or sports, Garmin Handhelds GPS are great handy devices to locate you and your friends, keep your tracks and communicate with your friends. They are also popular among hikers, city cyclers, off-road mountain bikers, and sailboat racers. Most of GPS devices have to acquire the signals from satellites after they started up. After the connection is established between the GPS device and satellites, the GPS device will download the location data from the satellites. This data download process typically takes about 30 minutes. The new generation Garmin handheld GPS has built in Hotfix software. This software allows the device continues to download data from the satellites after the device has been located and "fixed" the location. Once the Garmin GPS devices have received the data, they can calculate the location of those satellites for the next three days. As long as you use your Garmin GPS again, it will repeat the process and keep your device up-to-date. This can dramatically shorten the initial start up time of the device instead of getting the data from the satellites every time. 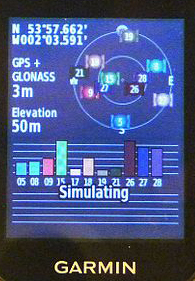 Some Garmin GPS handheld devices work with GPS and GLONASS satellites which are able to receive 24 more satellites signals than normal GPS only devices. The GLONASS also has a faster connection speed and better signal strength. Combine with GPS and GLONASS, Garmin eTrex and GPSMAP series handheld drives are able to acquire satellites up to 20% faster than devices that rely on GPS alone. The Garmin BirdsEye Satellite Imagery is a software that download to compatible Garmin GPS devices which offers high - resolution satellite imagery. It gives a true representation of surroundings. This software is yearly subscription so it will have to be renewed 1 year after the activation date. Otherwise, you won't be able to update the imagery after it is expired. However, the imagery has already download into the GPS device does not expire. Images updated frequently for greater accuracy. Plus easy to download and update. Allows you to layer vector maps on your handheld (such as TOPO maps or City Navigator) with BirdsEye Satellite Imagery for a real-life view of roads, buildings and terrain. The Garmin eTrex GPS handheld is perfect for outdoor enthusiasts on a budget. It helps you navigate through the toughest terrain. The unit is equipped with a high-sensitivity, WAAS-enabled GPS/GLONASS receiver, which locates your position quickly and precisely and maintains its GPS location even in heavy covers. The GPSMAP 64 series boasts a 2.6-inch sunlight-readable transflective colour display and a high-sensitivity GPS and GLONASS receiver with a quad helix antenna for superior reception. GPSMAP 64 series has built-in worldwide basemap with shaded relief, and also supports BirdsEye Satellite imagery and TOPO maps. The Garmin GPSMAP 64S model is able to connect smart phone wirelessly via bluetooth with smart notification, and sync data with Garmin Mobile apps. It also connects to compatible Garmin devices via ANT+, such as heart rate monitors, VIRB camera and other Garmin handheld devices. The Garmin GPSMAP 64ST comes with reloaded Topo AU/NZ lite Map, and the Garmin GPSMAP 64SC has built in GPS camera which you can take phones with your location, date, time information. The Garmin Rino 750 is a combination of 2 way raido and GPS personal handheld device. It allows you talk/text to your friends and location just in seconds. The Rino 750 is a 5 watt UHF radio and GPS device with 3" glove-friendly colour touchscreen, barometric altimeter, 3-axis compass and rechargeable Li-ion battery. It also has capacity to install AU TOPS deltail Map, BlueChart G2 Map to the microSD card with micro SD card slot.